Innovative. Vibrant. Independent. That’s the spirit of Austin, and Austin Monthly embodies that unique spirit. From culture to cuisine to current events, we curate the best of what our city has to offer. For longtime residents, newcomers and visitors, Austin Monthly is the award-winning publication that informs, entertains and creates conversation. This glossy, full-color, urban lifestyle magazine brims with creative and intelligently written columns, personality profiles, useful resource guides and riveting features. Austin Monthly captures the attention of our readers with insightful articles to keep them up to date. From stories and columns to restaurant reviews, personal essays and listings about events, fashion, shopping, dining, the arts and business, Austin Monthly depicts our home. 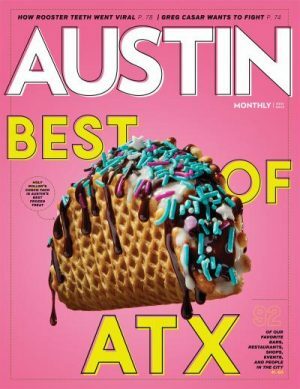 In content and style, Austin Monthly aggressively targets a readership of successful, educated, well-traveled professionals who are in the prime of their lives and at the peak of personal consumption.